hilde81 - Bristol, il AWESOME, in a can. "My bike gets dirty cuz it gets ridden. The bike may be dirty but the chain looks great and is PROTECTED along with my sprockets! So nice not to have chain goop flung all over SAM-H#LL. THANKS MAXIMA/MOTOSPORT!!!" Monster - Fort Smith, Ar. Chain lube "Very good chain lube. 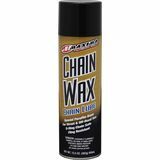 I have used this chain lube for over 10 years now and it is the best that I have found. By using it every 300 miles, I can usually get over 30,000 miles on a chain and sprockets. The last one over 34,000 miles."